Evernote is astounding, and like I’ve already said with Diigo and Voicethread, I don’t think I’ll be able to adequately explore its full potential in this inquiry. However this week has lead me in new and unexpected directions as I have begun to explore Evernote. All three applications are examples of cloud computing and the implications for educators and students alike, are inexhaustible (Anonymous, 2009). I’m not sure why I’ve never crossed paths with Evernote before. The teacher in our Autism Spectrum Disorder classroom uses it religiously. Most of his students have their own laptops, provided by the board of education, so he really reaches his students through computers. However, as we all know, what works with special education students, helps all students. Evernote is one of those things. friends through the share menu (shown above). Diigo allows friends to follow lists. 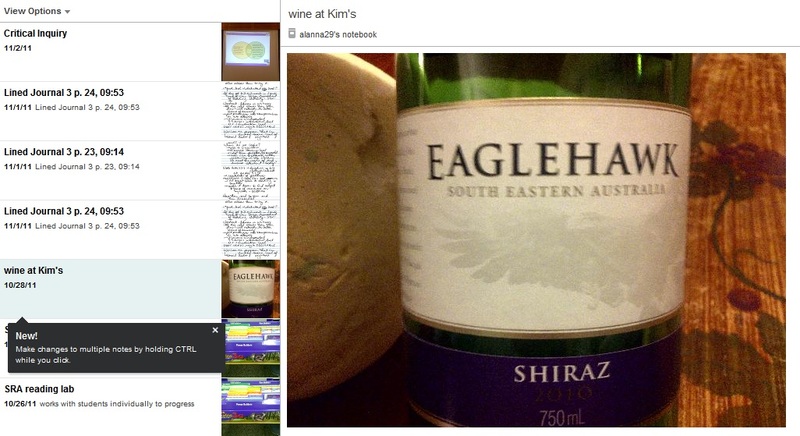 The second is that Evernote can bookmark anything by taking a picture of the item and then bookmarking it. Here’s a practical use. I’m having a bottle of red wine, which I find quite tasty, so I open up Evernote on my phone, take a picture of it with my phone, title it and tag it and I can refer to it whenever I want. The biggest advantage of Evernote to Diigo is that Evernote is available for iPhones, Android phones and Blackberrys. It crosses platforms and is usable by all smartphones. For this reason alone, I think it makes a more viable entry point for students to access rather than Diigo. By surprise, I realized that Evernote will also sync with my Livescribe pen. I’m new to the Livescribe pen, which digitally records the audio of a discussion at the same time as a video of what I’m writing and then you can save it as a pencast. I think Livescribe has the potential to be a game-changing tool for education, and it appeals to me and many others in this sandwich culture between print and digital. By linking the pencast to Evernote, I can then tag it with a bookmark title, and add it to my library. If I was to do the same thing with Diigo, I would have to upload the pencast to the internet first, bookmark it, tag it and then I could find it in my Diigo library. In a perfect world, Evernote and Diigo would be friends, and I could share the same library with both apps, or they’d merge, and their love child (Evergo? Diinote?) would be beautiful. I’m starting to develop a secondary school continuum of digital literacy, and I believe that Evernote would be an excellent tool to use with Intermediate students, and I’d bring Diigo into senior students who are deepening their research. The rest of the world will begin to see the essential need of these kind of tools for organizing and prioritizing reading. If the scope of the resources available online are infinite, then digital libraries will become as commonplace as buying a set of encyclopedias was for previous generations. Anonymous, . Cloud Computing. (2009). Library Technology Reports, 45(4), 10-12. Retrieved November 5, 2011, from ProQuest Education Journals. (Document ID: 1730425741). 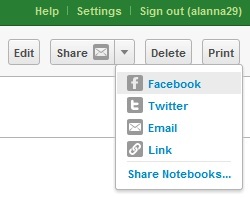 Hello Alanna this is Ron from Evernote. I came across your post and wanted to drop by and say hello and thanks for putting this together. Glad to hear you’re starting to us Evernote. Let me know if you have any questions of feedback. We really appreciate all of the support. Thanks for presenting a new take on Evernote. While I use Google Docs more often, I’m looking more towards Evernote due to it’s ease to syncing with Livescribe. I’ve had no luck doing the same with Google Docs. Love your posts and exploration of these new tools.